Def Leppard played a show at the Fontes do Sar in Santiago de Compostela, Spain last night and setlist details are available. The band played 8 songs from the Hysteria album in a setlist which has yet to be fully confirmed. 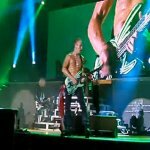 One piece on Def Leppard history was created as 'Women' was used as the show opener for the first time ever. 'Make Love Like A Man' returned the the set for the first time since April in Las Vegas. Feel free to confirm the songs played if you attended the show. The next show takes place on 2nd July in Helsingborg, Sweden. Played as the show opener for the first time ever. Played for the first time since 10th April 2013 in Las Vegas, NV.